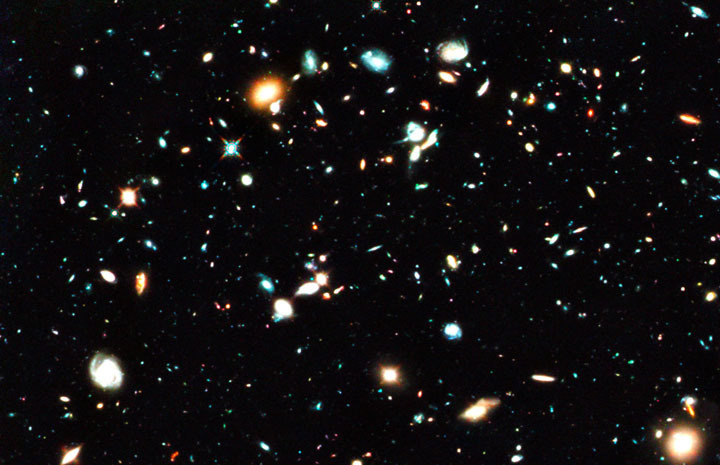 History of Galaxies -- Why do we exist? A telescope is a Time Machine: We can watch the history of the universe unfold by observing galaxies of various distances. The further away they are, the longer it has taken their light to reach us. When it finally does, this light contains information about these galaxies and the universe as they existed in the distant past. Using this trick, the Subaru PFS will follow the growth of the full panoply of galaxies from cosmic dawn to the present day, allowing us to ask "Why do we exist in the Universe?" Galaxies, however, appear smaller and dimmer the further away from us they are and the most powerful telescopes are needed to see back to the most distant times. The light collection power of the Subaru telescope and the unprecedented wavelength coverage of the Subaru PFS enable us to peer back very far indeed. We will observe about half a million galaxies within 10 billion light years of the earth, 30,000 very bright galaxies up to 10-13 billion light years, and quasars (the brightest objects) up to 13 billion light years. We will conduct the first census of early galaxies up to the epoch of star and galaxy formation. Compared to existing or planned surveys, the impressive capabilities of the Subaru PFS will remain unique well into the next decade.. Right figure: Hubble Telescope images of various distance galaxies. We see galaxies of apploximately from 5 billion to 11 billion years ago. Lower galaxies are considered to be older. Click the figure to enlarge.